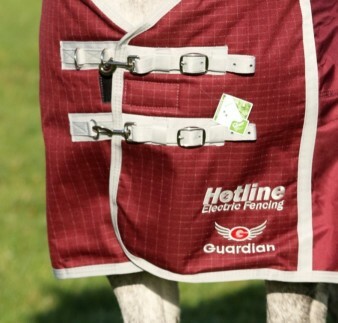 Anywhere the neck cover touches the electric fence, the pulse is transferred to the underside of the horses neck on the inside of the neck cover; this preventing leaning and ducking under the fence. Our current success rate at preventing escapes is approximately 99.5%. We are so confident we always offer a full no quibbles refund to anyone who isn't 100% satisfied. Guardian vs Houdini "The Big Lad"
Can you layer up rugs underneath a Guardian rug and still get the electric fence benefits? 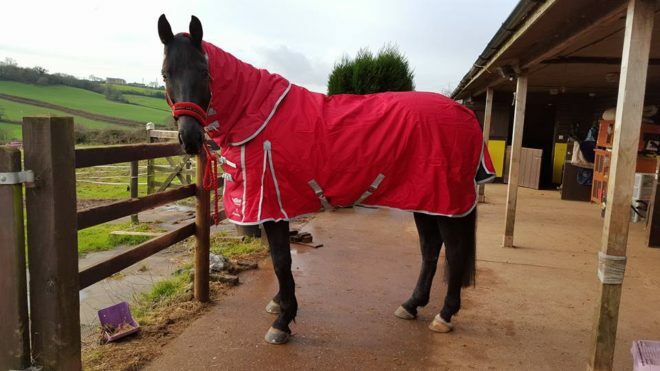 Yes absolutely, we have a soft inside strap designed specifically so you can layer any brand or thickness of rug underneath our electric fence proof rugs and still get 100% effect from your fence – keeping your horse warm cosy but firmly behind their fence. My horse goes through the fence even when not wearing a rug – will your rug rug for my horse? We tend to find the answer is yes, of course we cant guarantee 100% but our success rate is around the 99% mark so pretty close! 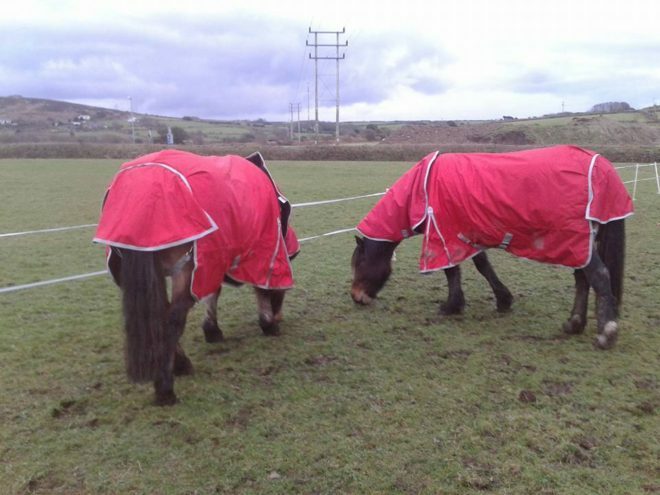 Most horses that go through fencing without a rug on use their manes as a their escape weapon to avoid the pulse, we recommend using one of our rugs with a neck cover that are all designed to prevent horses ducking under or leaning on a fence. There is lots more on this subject on our FAQ’s page – take a look or of course get in touch. How much of a zap will my horse get? 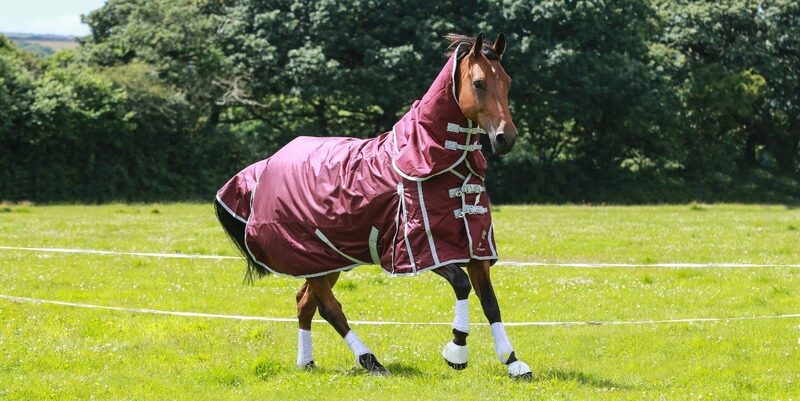 Our rugs simply transfer the pulse from the fence to your horse, the rugs won’t increase or decrease the voltage. However, because the contact with the horse is on their shoulder it creates a good route to earth so they get a definite “zap” instead of just a small zap if they slightly touched a fence. This helps to install a really good respect for electric fencing. We regularly convert even the most determined houdini’s into absolute fence angels with our rugs, and we love the smug calls from satisfied customers who are relieved they have won against their houdini and found a solution. Do your rugs use any wire? How do your rugs come up size wise? We tend to find the Fence Busters (250g medium weight range) are pretty true to size but can come up slightly generous for finer breeds, if you horse is between two sizes, go for the lower, but for anyone else stick to your normal sizes. For our Genius range (0g no fill range) these are true to size but can come up a bit smaller on bigger breeds, if your horses is between sizes, go for the higher option in this range, but anyone else stick to your normal sizing. Normal rugs prevent horses from feeling the effect of an electrified fence because the thick fabrics and padding prevent the pulse or shock from being felt by the horse, so they simply lean on the fence and push their way through. Once they have learnt this trick it can become a real problem; so we have designed a rug that works with an electric fence to prevent escapes. 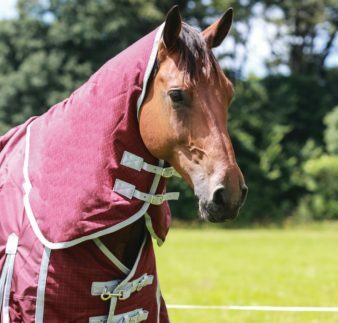 Our rugs use clever fabrics that pick up the pulse from an electric fence and transfer it instantly through to the inside of the rug or neck cover; making sure the horse feels the fence instantly on contact and prevents escapes. We use a special fabric on the chest of the rug that picks up the pulse, the grid within the fabric means anywhere the horse touches a fence on the chest/shoulder of the rug; the pulse is instantly transferred to the horse. The inside contact point where the horse feels the pulse from; always needs be in direct contact with the horse, so if you want to layer up rugs underneath; just slide them underneath this clever contact pad – so no matter how many rugs you layer up – you always have full effect of the fence. 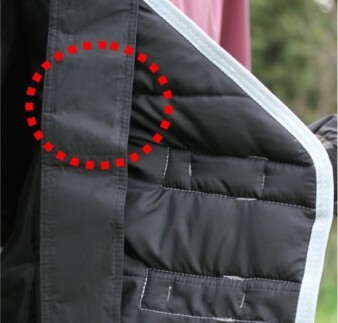 However, the neck covers can only have anti-rub type hoods of very thin material layered underneath, anything thicker will prevent the neck cover working. Our neck covers even prevent escapes from horses that go through the fencing when not wearing a rug, horses that duck under fences often avoid feeling the fence by using their manes that protects them from the pulse from the fence – using our neck covers resolves this problem with a 99% success rate, again we are so confident in the performance of our products to prevent escapes we will always offer a full refund to anyone that isn’t 100% satisfied.